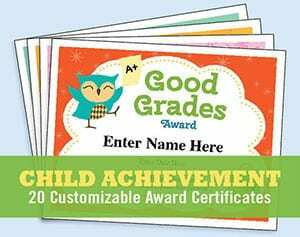 These Child Certificates – Achievement – 20 customizable certificates areto recognize great achievements in a kid’s life. You’ll get 20 certificates. Recognize kids for various achievements with: “Aced the Test” certificate “Santa’s Nice List” certificate, “Good Grades” certificate, “Homework Hero” certificate, “Coolest Kid” certificate, “Certificate of Recogntion” certificate, “Princess Award” certificate, “Best Halloween Costume” certificate, “Classroom Helper” certificate, “I Completed My Chores” certificate and others. When you purchase you’ll receive a PDF file that can be used on Mac’s or PC’s. Use them year-after-year for multiple teams – it’s a great deal! 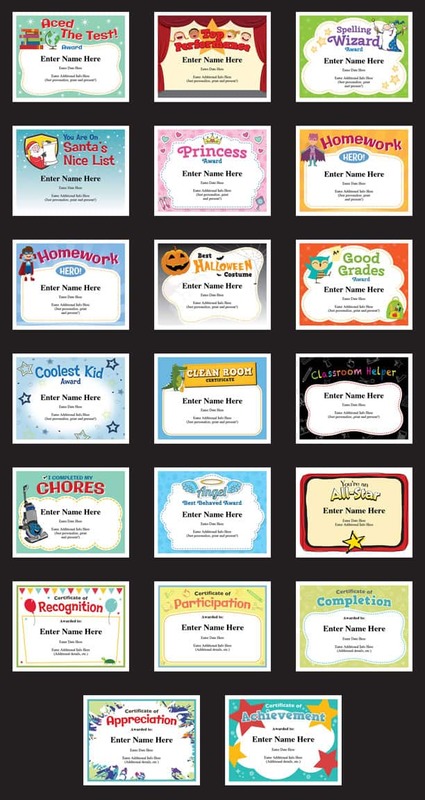 You can personalize these kid award certificates templates with kids’ names, the date, and your own words of praise. Designs are set to work on standard 8.5” x 11” paper. These will add a lot of fun to a kid’s accomplishment. • Quick and easy to do. You just type in your text, print and you’re good to go. Personalize, print and present. Super simple and the certificates looks very polished and professional. • Put a smile on your kid’s face! Who doesn’t like a little recognition? Your kid will love these certificates. Reward them at just the right time after they’ve completed an important achievement in their lives. It will create a lasting impression. • Professionally designed. They’ll look good on the fridge, wall or bulletin board. • Print as many as you like. Use these for you kids, your nephews and nieces, neighbors and more. 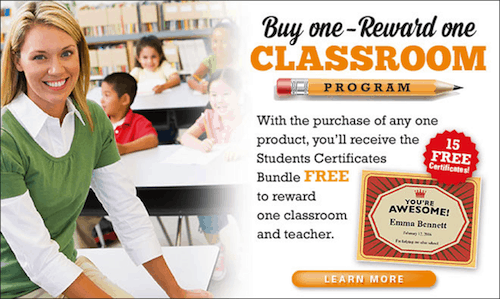 Buy these Child Achievement Certificates and reward your favorite teacher!